WineLoversPage.com / SemiCool 2007 - The Year it Almost Didn't Happen! The Year it Almost Didn't Happen! In place of the usual picnic, revelers gathered Saturday in a comfortable hotel conference room. In the summer of 2007, MoCool's 17-year-long string came dangerously close to snapping. An irreconcilable schedule conflict ruled out the usual lakeside picnic venue in the countryside near Ann Arbor, and no immediate alternatives were available. Without a place for a party, the local organizing committee regretfully announced that there'd be no MoCool. But as participants had always predicted, even if they called off MoCool, there would still be a MoCool. And sure enough, a band of stalwarts in the WineLoversPage.com online WineLovers Discussion Group soon hatched a plan. Picnic or no, they'd gather in Ann Arbor on the usual weekend, bring wine, meet friends, go out to dinner and find a place to spend a happy Saturday socializing, sharing wine and good things to eat. With many thanks to a cast of organizers too numerous to mention, but certainly including OW, BobH, the Noland Brothers and JuliaB, when there was no MoCool there was still SemiCool. 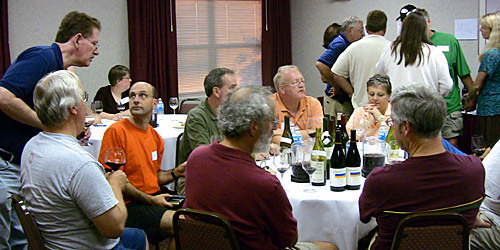 Wine lovers gathered from all over, just as always, and the usual MoCool spirit filled a happy weekend that included a fine dinner at The Earle in Ann Arbor, a sociable indoor "picnic" at the city's Hawthorn Suites hotel, a "horizontal" of 1998 Chateauneuf-du-Pape and the usual impromptu in-room tastings. 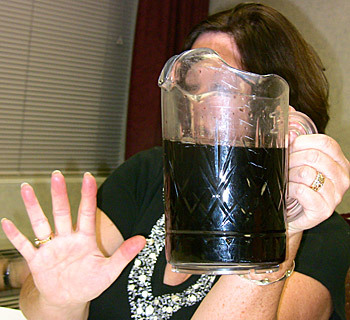 Here, as originally posted on the WineLovers Discussion Group, is Robin Garr's report - including tasting notes on more than 60 wines - from SemiCool 2007, the year that MoCool almost didn't happen. The trip up to Detroit was uneventful, a Good Thing. Northwest Airlines' Pinnacle commuter operation got us on the ground in Detroit on time, then took an unreasonably long time getting us in to the gate, parked and off the aircraft. When I finally emerged, 20 minutes late, there was John F at my gate, waiting impatiently, resplendent in his signature turquoise cap. We claimed our bags, grabbed a van to car rental, and picked up a barge-size Chevy Impala (it's hard to find a Japanese cars to rent in the Motor City!) It got us over to Ann Arbor in good time, despite an irritating, intermittent (and apparently lying) low oil warning, and before long I was in my room checking E-mail. Pretty soon I heard a banging on ... the door? I went and opened it. No one there! I looked down to see if pranksters had left something burning on my porch, but nope! All was well. Weird. Then I got a phone call. Julia B was in the next room, and she was banging on the wall to invite me over to join other early arrivals for a tasting. Awwright! I walked next door, and there were Julia B, the Noland brothers, BobH and John Fiola. She handed me an O glass (I like them!) full of a pink fluid. I sniffed it and wasn't particularly impressed. Something sour and acidic, just a whiff of salad dressing and something herbaceous. Hmm. It turned out to be a Sangiovese pink from California. A South African Pinotage rosé didn't particularly ring my chimes either - stinky with sulfury reductiveness. I didn't give it time to blow off, but moved on to a 2006 Lancyre pink from Languedoc that was much more attractive, berrylike, tart and dry. McManis Petite Sirah from California (didn't catch the vintage, but current release; a Gallo property, I believe) reminded me surprisingly of the 2001 Grange I had the other day: Loaded with raw new oak on the nose; deep black plums and more oak on the palate, but lots of body and structure. I expect the Grange has more potential, though. Joseph Drouhin 2005 Savigny-Les-Beaune was young and primary but much to my liking, with good, not overwrought Burgundy sour cherries, nicely structured and plenty of tannin. I think some in the room liked it less, but I think it's just fine now and will be even better in three to five years. This is an attractive restaurant and wine bar, located downstairs from street level, with an excellent wine list and very large cellar. The SemiCook group was given a private room with two long tables, just enough to seat the 18 of us in friendly proximity, but tight enough to deter walking around. I'd call the food good to excellent, not great - I had a fine delmonico steak somewhat diminished by being cooked medium-well (I had asked for medium-rare). Others reported similar issues with tuna, although those who had the duck or scallop options put two thumbs up. Red potatoes were still half-raw, and green beans were a bit underdone, too. A Mediterranean salad with arugula, grape tomatoes, grilled eggplant and feta was outstanding, only slightly offset by a little too much oily vinaigrette. The dessert tray offered a lot of tempting selections, and I rapidly devoured my choice, homemade mocha-cognac ice cream topped with slivers of bittersweet chocolate. Overall, not a bad meal at all, but I'm spoiled by constant exposures to the hot spots in my home town, and would have rated this maybe in the upper 70s on a 100-point scale, especially with price taken into consideration. The wines were interesting and well selected. Applause to the organizers for their picks. I didn't take notes and didn't even write down the label info, so all this is from memory and subject to correction. Gruet New Mexico Blanc de Noirs - John F and I toasted Chat Princess Cynthia by starting with a New Mexico bubbly, and a nice one it is. A little less body than I'm accustomed to in a Pinot-based sparkler, but good, steely acidity and clean fruit places it well above average in the sparkly department. I didn't taste the other aperitif, a bubbly from Domaine Chandon. Four wines were poured with dinner, and most of us chose the pink and the white with the salad course and the two reds with the main. Domaine Lafond 2006 Roc-Epine Tavel Rosé - Nice pink, berrylike and dry. I didn't really focus on it, but it was surprisingly good with the Mediterranean salad, even with its vinaigrette. Vincent Girardin 2000 Chassagne-Montrachet Morgeot 1er Cru - Great stuff, I think several of those who chose the scallops and had it as their main-course wine declared it WOTN. Golden, rich, lots of fruit remaining, some tropical fruit, with gentle, appropriate hazelnut notes showing its maturity. Not great with the salad - I sipped it as another aperitif - but I liked it. I'm curious that Wine-Searcher shows no 2000s in the open market, while every other vintage since 1998 (plus 1995) is still on the street. Anyone know if 2000 was highly rated and blew out, or what? Chateau Coufran 2000 Haut-Medoc - A bit of an oddity from the Medoc, with mostly (80%) Merlot in the blend. No matter ... I might not have guessed that from its structured, tannic body. Good Bordeaux, characteristic cassis and subtle earth. Very fine with the steak (even medium-well, snort), which "wiped" the remaining tannins. Plenty of time left for further cellaring, I'd say. Vincent Girardin 2000 Savigny-Les-Beaune Les Peuillets 1er Cru - Okay, I'm a sucker for Burgundy, even relatively modest villages Burgs like this one, but this was one of the evening's favorites for me. Velvety, tart cherries and earth, excellent mouth-watering acidity, tannins soft if not resolved, maybe a whiff more of oak than I really love in a Burg, but still. Fine with the steak. Only glass I finished. Later, some generous people (Mike H? OW?) bought a couple more reds off the list and passed them around the table. Penner-Ash Willamette Pinot Noir - I didn't catch the vintage, alas. Good Oregon Pinot, full and ripe, lots of that West Coast character that reads as cherry cola to me. On its own, I would have liked it a lot. Next to the Savigny-Les-Beaune, it was a no-brainer for me, based on my personal preferences. I pushed the Oregon Pinot back and got another little taste of Burgundy. Edmunds St. John 2000 Los Robles Viejos Paso Robles Red - Okay, we all know and love Steve, and we're all predisposed to like his wines. But doggone it, I'm absolutely certain that I would love this wine if it was thrown at me in a double-blind tasting. Such a great balance of fruit and earth, balance and texture. I could have sworn I was sitting there swirling, sniffing and tasting a really good Southern Rhone, one of the better villages (Vacqueyras?) or maybe even a maturing Chateauneuf-du-Pape. A dead heat with the Burg, closely trailed by the Coufran, as WOTN for me, although the white Burg wasn't too shabby either. We always said that if the MoCool organizers ever called one off, we'd still be there all the same, and sure enough, this wacky prediction seems to have come to pass. Aren't we glad? Baumard 1996 Savennieres - Mature, appealing, hazelnuts and almonds, beeswax and wool, still good white fruit. Zardetto Prosecco - Frothy, crisp, refreshing, near-dry. Excellent aperitif. Chehalem 2003 Willamette Valley Reserve Pinot Gris - Crisp, light white fruit, a touch of oak. Pleasant, a bit short. Chateau Grand Traverse 2005 Old Mission Peninsula Edelzwicker - Pale gold. Lovely, subtle floral notes. Crisp and fresh, just off-dry. First chapter of the afternoon "picnic" at the Hawthorne is now history, as proceedings begain with a tasting of a dozen Chateauneuf-du-Papes and other Rhones, all from the 1998 vintage, contributed by revelers. It was a generous act of sharing by many parties, and few complaints were heard. From a coldly critical wine-geek standpoint, there's some support for the early concerns that the big, happy 1998s wouldn't age as well as more classically styled Chateauneuf: Many of these are browning and showing hints of maderization before their time. But even the few more "tired" items were still very enjoyable, far from dead; and a couple are going very strong indeed. Now the event will move on into the controlled chaos of "picnic" mode, with everyone sharing excellent wine and food. More to come in later reports. Domaine Delubac Cairanne Cotes du Rhone Villages - Hazy garnet. Berries, earthy. Mature. La Grand Montmirail Gigondas Les Bruneau - Pretty, translucent garnet, clear bronze edge. Perfumed. Peppery. Past peak. Domaine Les Pallières Gigondas - black fruit and fragrant black pepper, delicious. Chateau La Nerthe - Looks brown but tastes fine. Dried tobacco leaf. Ripe and sweet, mature, a bit "porty" but delicious. Grand Veneur - Brown, looks dead. Berry fruit remains, good dark chocolate, but it's on its last legs. Domaine du Lys "Penelope" VdP des Cévennes - Black. Grilled meat, pepper, very nice. Going strong. Vieux-Telegraphe - Brown. A lot of nutlike maderization. Opened 24 hours ago, fine then but went dowhill fast. Pegau - Ruby, bronze edge. Plums, smoke, a whiff of barnyard, ripe and sweet, still plenty of soft lmannins. Holding up very well. Best to this point. Bois de Boursan - Reddish-violet, bronze edge. Red fruit and meat, good structure and length. Chateau de la Gardine - Translucent purple, brick edge. Black fruit and smoked meat, most well-preserved yet. Deep fruit and fragrant pepper, fine structure and balance. Chateau de Beaucastel - Bronzing, maderization cutting around the edges on the nose. Still splendid on the palate, though, deep fruit and relatively discreet Beaucastel barnyard. Domaine de Pegau Cuvee Laurence - Dark purple. Perfumed, still young. Ripe, structured, lots of fruit and tannin. Could use still more time. Excellent, best of the flight. In the absence of the usual MoCool lakeside tent and lodge, the conference room at Ann Arbor's Hawthorne Inn didn't make a bad substitute. There was a lot of MoCool feeling there as about 40 people - visitors and locals - brought about 80 wines and a remarkable spread of sweet and savory goodies to share. Beginning minutes after the 1998 Rhones tasting (previously reported), the party ran on for a good six hours, and a few diehard revelers were still going strong when I finally packed it in a short while ago. I took quick and rough Palm PDA notes on 30 wines, probably tasted a few more that didn't get written down, and likely missed as many more, although the number of wines so dramatically outnumbered the crowd that quite a few bottles will go back home unopened. More for next year! And, MoCool having weathered this storm in fine style, thanks to a large number of people who helped, it seems quite certain that, one way or another, there will be a next year. See you then! Finally, here are my TNs. Comments, quibbles and corrections are welcome as always. Dom. J. Vidal-Fleury 1999 Côte-Rôtie - Dark garnet. Lots of smoky bacon over black fruit. Full, ripe and youthful. E. Guigal 1990 Côte-Rôtie Côtes Brune et Blonde - Browning. Good grilled meat and bacon, but past peak to my tastes. Bastianich 2006 Rosato Venezia Giulia IGT - Attractive pale salmon. Fresh red berries, crisp and tart. Outstanding Refosco rosé. Mitchelton 2000 Airstrip Marsanne - Pale gold. Apricot and peach. Full and rich, seems sweet but just off-dry. Stag's Leap Vineyard 1994 Napa Valley Fay Cabernet Sauvignon - Beautiful garnet. Subtle cassis, black fruit, great structure and length. At peak. Louis Jadot Domaine Gagey 2003 Savigny-Lès-Beaune Clos des Guettes - Dark ruby. Layered Pinot fruit. Big, an '03, but one of the best. Joh. Jos. Prum 2001 Graacher Himmelreich Mosel-Saar-Ruwer Spätlese Riesling - Pale brass. Apricot, mango and slatey minerality. Fresh-fruit sweetness and steely acidity in perfect balance. Amazing with an unexpected match: BobH's Kamodo pulled pork with his spicy sauce. A.. Rafanelli 1999 Dry Creek Valley Alexander Valley Zinfandel - Jam and earth and charred red fruit, hot finish. Edmunds St. John 2003 Shell and Bone Paso Robles Red - Clear garnet. Fresh and clean, cherry-berry fruit; crisp, defined, an edge of chalky minerality. Kinkead Ridge 2004 Ohio River Valley Cabernet Franc - Dark garnet. Ripe and plummy, chocolate and chernies, a lot of oak but good structure and fruit make it a winner. E & J Gallo 1992 Sonoma Cabernet Sauvignon - Black plums and menthol, fine structure, going strong. Beringer 1992 Howell Mountain Bancroft Ranch Merlot - Stylish and complex, very fine. The Four Graces 2003 Willamette Valley Pinot Noir - Ruby. Subtle cherries, elegant and appealing. More forward on the palate, intense but balanced. Burgundian..
Alain Voge 1998 Saint-Péray - Pale gold. White fruit and wool, full-bodied and dry. Germain Saincrit 1997 Chateau de Fesles Bonnezeaux - Bright gold. Amazing aromas jump from the glass, pineapple creme brulee. Unctuous, creamy, intense sweetness shaped by firm acidity. Might be WOTD. Mas de Daumas Gassac 2005 Blanc Haut Vallé du Gassac - Chardonnay, Viogner, Petit Manseng and Chenin Blanc in equal proportions. So floral that it's like burying your face in a bowl of flowers. Smells sweet but drinks dry, white fruit and stony minerality. Wonderful stuff. Gérard Bertrand 2000 Banyuls Grand Cru - Dark reddish-amber. Madeira-like, sweet and tart. Amazing with bittersweet chocolate, brings up a burst of raspberries. Guenoc 1980 Lake County (68%) Napa County (32%) Petite Sirah - Brownish, oxidized, but still showing some fruit. Bois de Boursan - Black fruit and chicken poop, tart and peppery. Nice. Pegau - Grilled meat and smoke. Smooth, sweet red fruit. Beaucastel - Barnyard and black cherries. .Yummo. Broadbent Madeira Reserve 5 Years Old - Clear mahogany. Walnuts, pecans and Meyer lemons. Ridge 1998 York Creek Petite Sirah - Deep and dark, brooding, very young. Viña Real 1964 Rioja Gran Riserva - Dark bronze. Prunes, dried fruit, cracked walnuts; very much alive. Voerzio 1982 Barolo - Blackish purple, bronze edge. Some oxidation, but Barolo tar and violets come through. Sine Qua Non 2001 "No. 6" Shea Vineyard Yamhill County Pinot Noir - Cherry cola, tomato skin and red fruit. A big wine, no mistaking it for a Burgundy. Brolio 1985 Vin Santo - Walnuts and pecans, golden raisins and lemons, sweet, Madeira-like. Morenico 1983 Erbaluce di Caluso Passito - Rich gold. Butterscotch and raisins, sweet but balanced. Intense and very long. Poggiopiano 2000 Rosso di Sera Toscana - Spicy black cherries, integrated oak. Big, really nice. © Copyright 2007 MoCool Ltd.
SemiCool 2007, The Year it Almost Didn't Happen!